Hey guys, what you see is what you get. They both shoot, they are both in borrowing condition. I used these for buddies wanting to get in to paintball. They both shoot great, but could use a cleaning and they don't look perfect. Cheap and easy shooters. 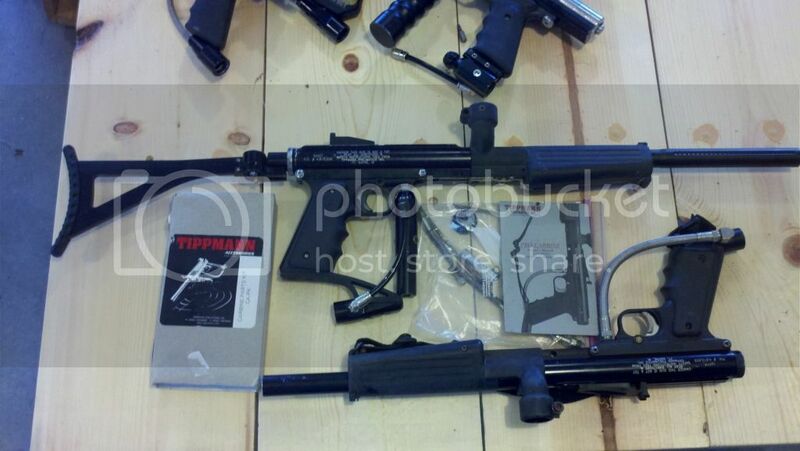 First one has a JCS folding stock, Rear velocity adjuster, Palmers Stabilizer, J&J ceramic barrel. The second one is stock as far as I can tell. I am the Wushi Finger Hold... Skiddousch! Last edited by BigDaddyJob; 07-11-2013 at 07:09 AM. Bump $135 for the pair! Last edited by BigDaddyJob; 06-13-2013 at 09:45 AM. Trade for mag parts? One or both? No thanks, I really need to thin down the collection... Thank you though. Back to the FRONT! Offers welcome! Interested but no cash right now. Would you take $100 shipped. Might do after payday this week.